Glitter balls at the ready! It’s that time of year again when dance fever hits the nation. 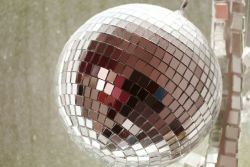 Glitter balls are made from mirror glass, but did you know that there are far less glitzy ways to bring mirror glass into your home or workplace for an equally dazzling effect? Mirror, or mirrored glass is a type of float glass (see Glass Manufacturing) that has a metal reflective coating applied to the back surface and is sealed by a protective layer. The metal coating creates the reflection. Most mirrors are back-silvered, containing silver that is visible through the glass. This is why mirror glass is also known as silvered glass. The exposed glass helps protect the mirror coating underneath from scratching or degradation due to weather, fingerprints and dust. What are the benefits of mirror glass? Mirror glass can be a stylish addition to your home or workplace, offering significant aesthetic and functional benefits. Mirror glass comes in regular, coloured and tinted glass options, creating versatile designs and a high degree of blend with other building materials. Like most glass, mirror glass can help make the most of natural light and has the added benefit of reducing unwanted glare. Mirror glass can be supplied with polished edges or ‘clean cut’ and can be drilled for screw fixing or bonded in place using mirror glass adhesive. Mirror glass can be used to enhance views and open-up small spaces. Just think of a lift (or elevator if you prefer). The small space, lack of air and inability to see out are all factors that can cause anxiety. Installing mirror glass helps to reduce this feeling through a sense of greater space. One-way mirror glass can also create privacy in your home or office, controlling the view through glazing. Mirror glass is a flexible glass product and has numerous applications. Its most common use is for framed or unframed mirrors – for example, in gyms or lift/elevators. Mirror glass is often used as a modern design feature in the workplace, eg through glass wall panelling or glass furniture; as well as for privacy, eg through glass partitions or one-way glass mirrors. Tufwell Glass carries full size, large stock sheets of mirror glass as standard and can cut this to almost any size and shape. Our mirror glass stock uses only the highest quality silver and is available with a security film to ensure compliance with all health and safety building regulations.